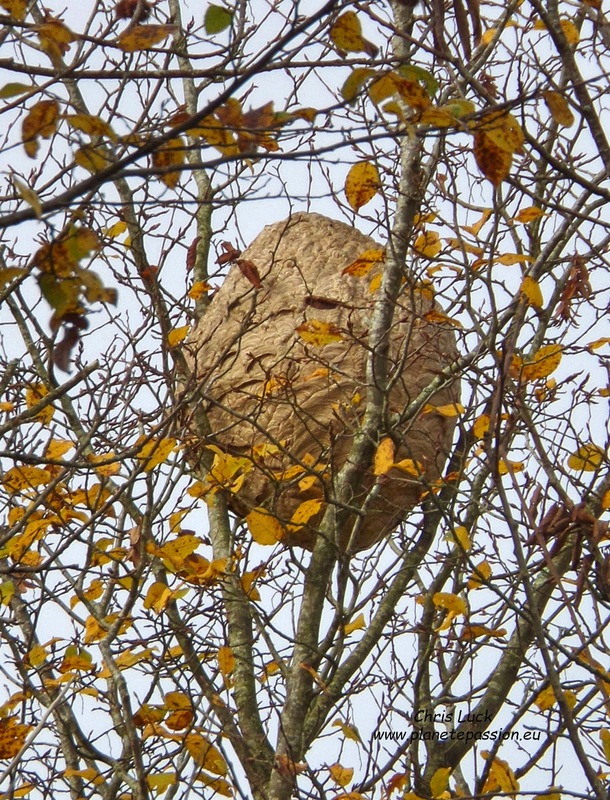 You may find this a bit hard to believe and it certainly is an eye opener but now the leaves have started to fall Lynne spotted this yesterday when I was out for the day – an Asian Hornet nest actually situated almost directly over one of my hives and no more than 30 metres from several others.Click on photos to enlarge. So what does this tell us? It tells us that maybe, just maybe, the Asian Hornet isn’t quite as dangerous to honey bees as has been thought. It also tells us to always be very careful when drawing conclusions based on limited third party information that may lack a solid foundation or without knowing all the surrounding facts of any given situation, something we can all learn a lesson from. Of course this doesn’t mean that they can’t be a problem in some circumstances and it may be that they are modifying their behaviour, adapting to local conditions and taking other prey or simply that one Asian Hornet nest won’t have a serious impact where there are a large number of hives. As I have mentioned many times I have seen Asian hornets present around my hives ever since 2006/2007 without observing them being anything other than a minor irritation for my bees. This one with the one I removed earlier this year from an empty hive makes me wonder just how many nests there have been within flying range of my hives but this is certainly fascinating for me, you can’t beat first hand experience. Pollen supplements and pollen traps. Not so much a secret as just not talked about.